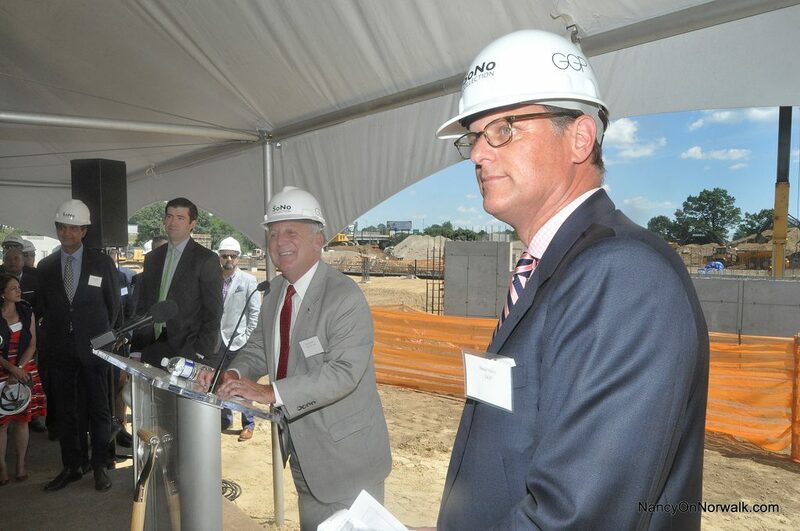 From left, GGP CEO Sandeep Mathrani, Department of Economic and Community Development Deputy Commissioner Tim Sullivan, Mayor Harry Rilling and GGP Vice President Doug Adams mark the construction of The SoNo Collection on Wednesday. Updated 8 p.m.: Minor edits. NORWALK, Conn. – The SoNo Collection has officially been christened. 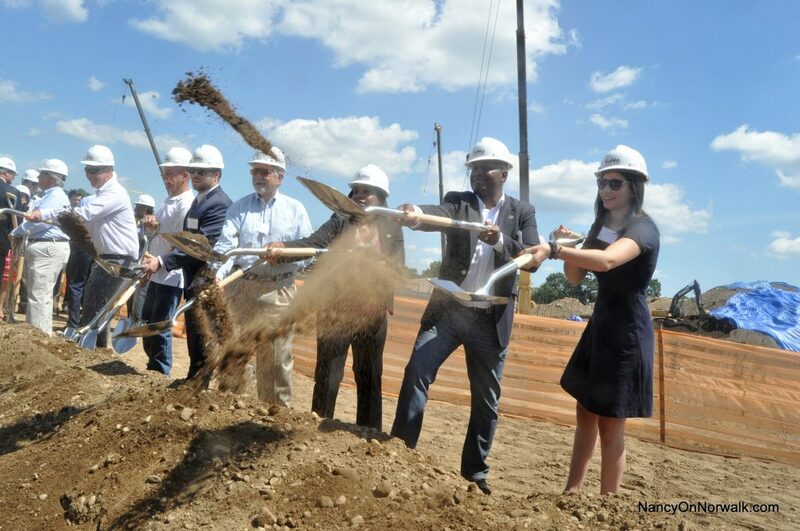 “People should appreciate that you may not see another mall get built in America for the next decade,” GGP CEO Sandeep Mathrani said Wednesday, as he and Norwalk officials lead a groundbreaking, standing where the mall’s restaurants are expected to be built, close to West Avenue. “As you can tell our contractor has gotten a lot of work done since this morning,” GGP Vice President Doug Adams quipped, a joke to recognize that the ground broke long before the ceremonial dirt tossing. Between 100-150 construction workers toiled on the property. Officials said pilings have been driven as much as 180 feet down to hit bedrock; it’s a dry site, and workers haven’t struck water except in two elevator shafts. Tiebacks are being installed to reinforce the existing retaining wall (bulkhead) for the elevated Danbury Branch where it passes through rear of the construction site. 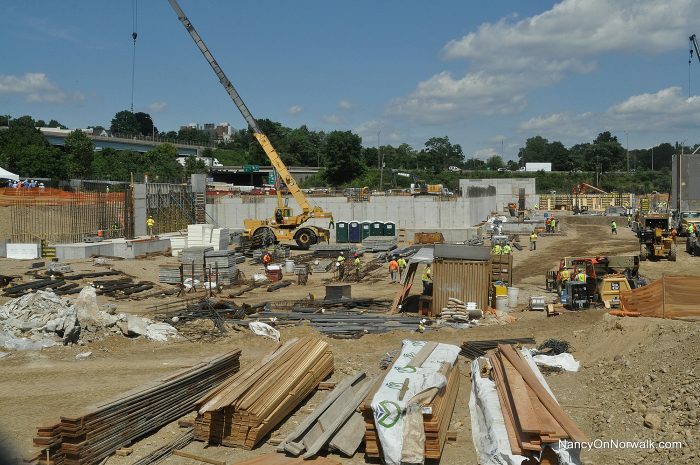 The foundation walls evident on the property are for the below-grade parking garage, Adams said. The land where officials stood will be raised five or six feet, and 100,000 cubic yards of concrete are expected to be poured. As a comparison, Turner Construction claims it used 57,000 cubic yards of concrete in the construction of Yankee Stadium. Mathrani said he didn’t know where contaminated soil has been taken. Construction is underway on The SoNo Collection. As part of his remarks, he acknowledged the risk GGP took in buying the property without approvals and estimated that the company is investing $525 million. The mall is about 65 percent leased, “which is also very unusual so early in the game,” he said. GGP has paid about $5 million in permit fees to Norwalk; there will be $18.5 million personal income tax paid during construction, $15.8 million sales and use tax and $23.3 million in sales tax yearly once the center opens, he said. Adams said he didn’t have a report yet on how many Norwalk residents will work on the site. “We’re just getting that feedback from our contractors. We are absolutely committed to the provisions LDA (Land Disposition Agreement) and we want to have as many local and minority businesses on the project as possible,” Adams said. Adams had promised community activists a report by July 31; Common Council member Faye Bowman (D-District B) said after the ribbon cutting that she didn’t know if it had been released yet. Local grocer Stew Leonard attended the groundbreaking, amusedly asking Mayor Harry Rilling during the proceedings if any local supermarkets might be involved. “I hear we are in discussion with a local food provider to see how he or they might fit in,” Rilling said. The mall is a good thing for Norwalk, Rilling said during the ceremony, commenting, “Overwhelmingly, the community does support this mall, they are looking forward to it. A groundbreaking Wednesday on the “95/7 site,” where GGP is working to build The SoNo Collection. Only insiders get to laugh about this one. If GGP is working with the city has the city decided to accept a police substation yet? The question is before the election is the city working with GGP and representing the taxpayers on this substation. Most of the new malls saw as many as 30 new police officers added to the books with most of the newly built malls ,what is the mayors plan? Stew is no fool he has been working with GGP in Ny for a while ,this is why Hempstead leaves or misses meetings on GGP he cant participate. Its hard to believe our mayor doesn’t watch GGP on wall st its obvious our counselors don’t. Stock prices today are low 21 dollars matching the lowest 3 years ago,how can that be good? It was 31 dollars when the money was flying into Norwalk wonder if city hall got caught up in the hype? you may not see another mall get built in America for the next decade,” GGP CEP Sandeep Mathrani said with that said yes Norwalk may be a text book example why malls wont be built for a while. Whats the city planning to do with Sono,after the mall takes all the traffic and business away ? At least the jobs won’t need an H1-B visa to move the dirt. See 60 Minutes on Sunday? usually I post links to things that may change how a city reacts to a new mall ,this GGP mall acted on the last violent crime will Norwalk be able to absorb its responsibility or will they continue to ignore the obvious. Those politicians throwing dirt with smiles on their face why ,did someone pass gas? This mall is going to cost the city money,what money we see from taxes are already spent who is doing the math for the city? The shooting comes as Four Seasons, the city’s only indoor mall, is transforming. Indoor malls have lost popularity to so-called lifestyle centers such as Friendly Center — viewed by some shoppers as more efficient and convenient — and Four Seasons has struggled in recent years with store closings as well as the reputation of being a mall more for teenagers and young adults. feb 20014 is when GGP stock was this low, it has fallen to bankruptcy numbers and no let up in sight. $20 dollar stock is not what the shareholders are accepting right now. Maybe its a good time to buy GGP stock if your an idiot. If your a Norwalk taxpayer it may be time to just sell your home. Someone will pay for this mall and it may not be the stock holders.This ground breaking was a ploy to make the sock rise part of the game.Problem is its gone down over A 1.35 SINCE THE DIRT FLEW this week. 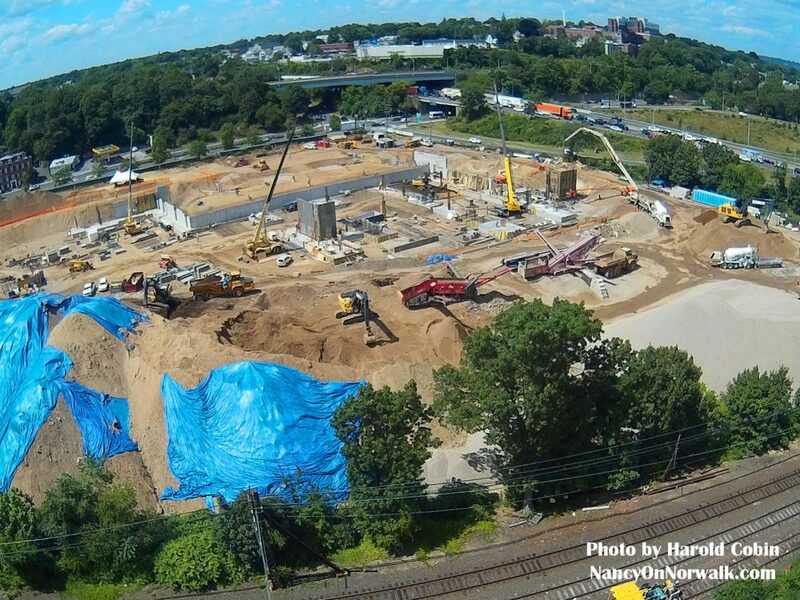 GGP news this week was cost over run anything else on Norwalk like ground breaking was simply a joke a true circus.,Norwalk had their clowns the ring master Duff was there lets give everyone credit the show was without GGP CEO drama. Bob Duff should of had a graph showing what the city and state has spent on this site over the years,the return investment has been so far been permits. Partners who will they be? consider the taxpayer investments so far. Ground breaking should of been in the graveyard.